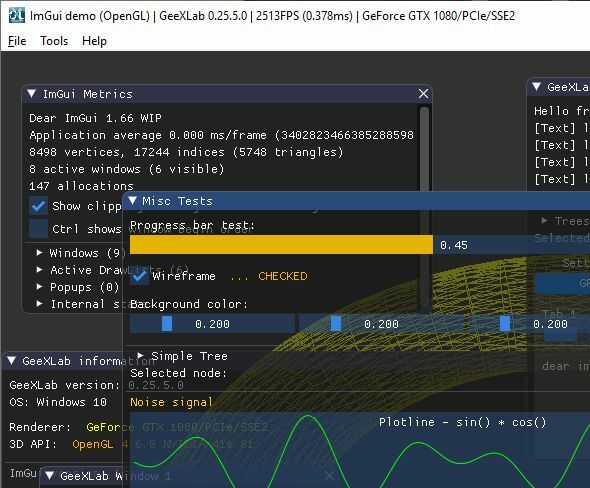 A new GeeXLab demo is available (demo_menus.xml) . This demo shows how to use the new functions of gh_imgui library to draw menus. 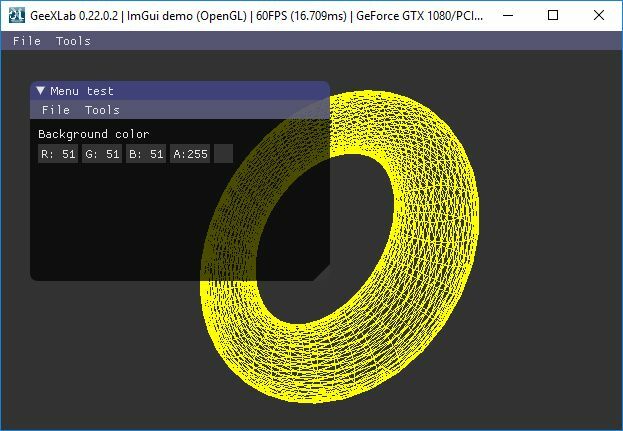 You need GeeXLab 0.22+ to run the demo. You can find it on the download page. I'm currently looking for a framework/runtime which allows me to easily create crossplatform gui's (with lua/python bindings). 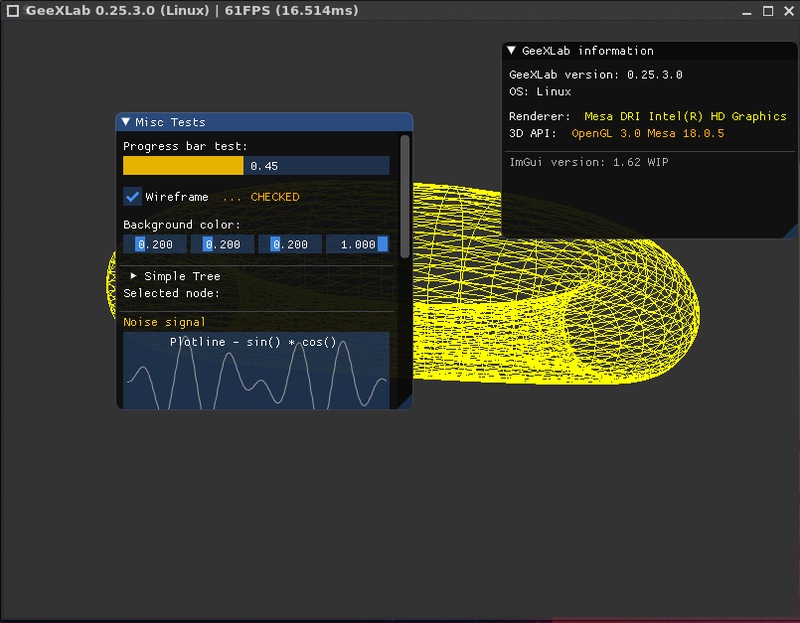 GeeXLab (with imGUI) seems great for that. Btw. how can I hide the default title/fps? It seems that on linux, the window-title is displayed for some milliseconds, and then gets overwritten by the fps-counter. Is there a way to simply display "My application" as the window title using `<window title="My application" ...>`? Again thx for this amazing gui! This feature is currently not available and to be honest, this feature is planned for the PRO version... or not. How about prepending the window-title? That way it is more readable when 'alt-tab'-ing between several instances. The FPS and stats are always very handy imho. [FREE] show a GeeXLab-logo during startup (like unity)..maybe a simple shader anim? Basically there would be X months of delay between shipping updates/features/changes between the pro vs free users. Looking at the current mature state of GeeXLab, delaying new features will not really interfere with new user-adoption imho. Companies who support GeeXLab could be served first, and they could be your small group to test new features with. You could simply re-upload the latest PRO-players-in-a-zip at gumroad.com, and setup a subscription-fee for download-access. Then you can just email them with private blog-links, which are scheduled for publishing X weeks later. Thanks for your ideas leon about the FREE vs PRO versions, I will consider them with attention. And for the title bar, I updated it as you proposed, it will be available in the next update of GeeXLab. I'll try to release the Windows version in the next days and the Linux one few days after. In the PRO version, the title bar will be fully customizable. Btw. today i've ported a imgui lua-example to python. Good news: it was fairly simple! One would almost think that the languages were inspired by eachother. So far all python (translated from lua) magically worked, including third party packages.